David Castillo Gallery is proud to present Sundown, Xaviera Simmons’ fifth solo exhibition with the gallery. 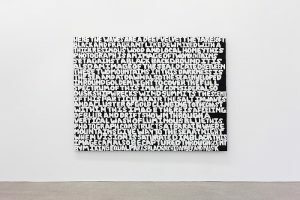 The show features all new text paintings, photography, and sculpture. Many communities in the United States remain “sundown towns,” where Black Americans are not welcome after dark. 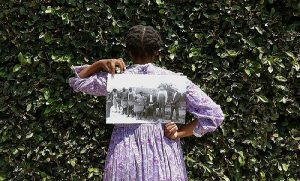 The works assembled in Sundown draw from the multitude of threads which form the foundations of the contemporary American narrative – slavery, colonial America, the Antebellum South, the Jim Crow era, Black reconstruction, Black migration, and the Civil Rights era. The exhibition explores these legacies and the ways in which systemic prejudices have rendered major aspects of the American narrative virtually invisible; the effects of which reverberate into the present day. In this rigorously researched body of work, Simmons engages with historical imagery, layering archival black-and-white images of American life across scenes that she as shifting characters inhabits. Sundown is to be considered in a chronological manner. The exhibition begins with Simmons’ signature text-based paintings, drawing from and abstracting language found in the diaries and observations of Christopher Columbus’ fateful encounter with the landscape now labeled America. Simmons’ text-based paintings render Columbus’ initial observations into poetic visual gestures where text acting as image renders the scenes Columbus encountered with sensuality and beauty. Simmons’ text strips away and molds aspects of Columbus’s diary language to reveal textual images that are idyllic yet loaded with an inherent historical conflict. 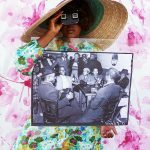 Using floral backdrops and patterns Simmons’ large-scale photographs seeks to both exclaim history as well as contemporize the narrative; to hold the narrative and to add to our complex contemporary practice of prioritizing image as narrator. These sculptural works, according to Simmons, are a hypothesis rendered in luscious furs, velvets, and leathers. The works are tasked with the question, what would our contemporary landscape look like had Black Americans been able to create continued generational stability within America without the consistent threat of disenfranchisement? What would our language, art history, architecture and overall American visual, sculptural and domestic landscapes look like had Black Americans had an opportunity as a group to collectively contemplate and capitalize from such things as craft and creativity with free will and freedom from threat over the span of the country’s lifetime or at least since President Lincoln’s “Emancipation Proclamation”? The sculptural and photographic works in this exhibition seek to re-engage the historical narrative to recover some of the possibilities of this vision. Xaviera Simmons is included in numerous upcoming exhibitions and projects including “The Restless Earth” curated by Massimiliano Gioni, at the Phillips Collection, Washington, D.C. (2019); Miami-Dade County Art in Public Places Commission (2018-2019), among many others. Recent solo exhibitions include “Convene” at SculptureCenter, New York; “Overlay” at Radcliffe Institute at Harvard University; “The Gold Miner’s Mission to Dwell on the Tide Line” at The Museum of Modern Art- The Modern Window, New York; and “CODED” at The Kitchen, New York. Simmons is a recipient of Agnes Gund’s”>Gund’s Art for Justice Award (2018); Foundation for Contemporary Art Award; Louis Comfort Tiffany Award; former artist-in-residence at The Studio Museum in Harlem; and the Denniston Hill 2018 Distinguished Performance Artist Award. Current and recent museum group exhibitions include The Weatherspoon Art Museum, Greensboro; MassArt, Boston; The Renaissance Society, Chicago; Seattle Art Museum; Museum of Contemporary Art, Chicago; Nasher Museum of Art, Durham; Wexner Center for the Arts, Columbus; Prospect.4, New Orleans; Fondazione Nicola Trussardi, Milan; Studio Museum in Harlem; Museum of Modern Art, New York; Institute of Contemporary Art, Boston; Cincinnati Art Museum; Museum of the African Diaspora, San Francisco, among others. Simmons’ work has been featured and reviewed in many publications over the years, most recently in ArtNews, The Art Newspaper, Artnet News, Artforum, Hyperallergic, New York Magazine, Bloomberg, Paper Magazine, The New York Times and others. The artist’s works are in major museum and private collections including The Museum of Modern Art, New York; Deutsche Bank, New York; UBS, New York; The Guggenheim Museum, New York; The Agnes Gund Art Collection, New York; The Museum of Contemporary Art, Chicago; The Studio Museum in Harlem; ICA Miami; Perez Art Museum Miami; The Weatherspoon Art Museum, Greensboro; The Nasher Museum of Art, Durham; The High Museum, Atlanta; The Rubell Family Collection, Miami; among others. The artist received her BFA from Bard College (2004) after spending two years on a walking pilgrimage retracing the Trans-Atlantic Slave Trade with Buddhist Monks. She completed the Whitney Museum’s Independent Study Program in Studio Art (2005) while simultaneously completing a two-year actor-training conservatory with The Maggie Flanigan Studio.